Photo by Dan Michael: Nick Kyrgios playing in the BNP Paribas Open tennis tournament in Indian Wells, California. If you’ve lived in Seattle long enough, you’ve either been to, or know of the annual pilgrimage of Seattleites to the desert in an effort to get some sun and sanity during the seemingly endless periods of rain and cold that is a hallmark of the Pacific Northwest climate. 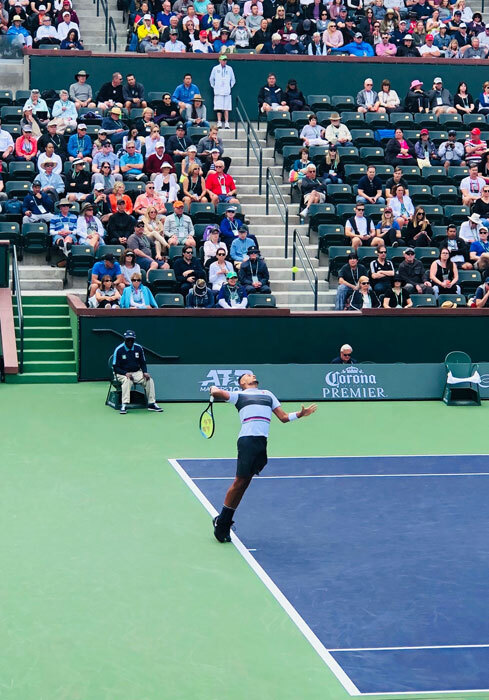 Recently, I had the opportunity to go to Palm Springs and experience the 2019 BNP Paribas Open tennis tournament in Indian Wells, California, to see what all the fuss was about. While it didn’t disappoint, it did make me realize that soon Seattle will be basking in the sun once again and so I’ve prepared a few thoughts to consider when doing your sport or exercise outdoors in 2019. • Brain food: The sunlight provides an important stimulus for our brain’s circadian rhythm (how our brain knows daytime from nighttime), which helps regulate melatonin, a hormone that helps us fall asleep and stay asleep through the night. It can also improve mood by boosting serotonin in the brain, which can help people who many experience Seasonal Affective Disorder. • More brain food: Vitamin D has many significant roles in human physiology. Other than helping regulate immune function, hormone production, and calcium regulation for our bones and blood, it also helps our brain function by protecting us from neurodegeneration seen in diseases like Alzheimer’s, dementia, and multiple sclerosis. • 30 minutes is plenty: For most fair-skinned people, your skin can generate up to 50,000 IU (1.25mg) of Vitamin D from just 30 minutes of direct sunlight exposure in a bathing suit. For dark-skinned individuals, between 8,000 and 10,000 IUs are produced. While recommendations of daily Vitamin D IUs vary between 400 IU/day and 4,000 IU/day, 30 minutes of sun in a bathing suit is enough for your daily dose. • The benefits outweigh the risk: The World Health Organization has said that excessive UV radiation exposure is responsible for only 0.1 percent of the total global burden, and that there are far greater risks associated with inadequate sun exposure to one’s health. However, consider your medical and health history when deciding how much sun exposure to get. • Outsmarting skin cancer is hard: causes of cancers are usually multifactorial, meaning your genetics, environment and habits play an integral role in your risks for developing the disease. However, we aren’t helpless in the matter. Some skin cancer types develop after many years of exposure to sun (squamous cell carcinoma, basal cell carcinoma), and some are the result of single overexposure events (melanoma). But, even if you stay out of the sun your entire life, there’s still a possibility you can develop skin cancer, so experts have identified a strong association with sun exposure, but not necessarily causation for some types. • Dehydration: being in the sun and heat drains your body of fluids. You’ve known this from an early age, but drinking more water may not be enough. Your blood is made of water, glucose, proteins, electrolytes (calcium, potassium, sodium, chloride and bicarbonate), fats and cells. When you sweat, you’re losing water plus electrolytes, and if you’re active in the sun, you’re also burning glucose. Dehydration then puts your muscles, tendons, ligaments and brain at risk for injury or poor functioning. • Be smart about your exposure: the key here is to get enough sun, so tat your body has a chance to soak up the good UV radiation for Vitamin D production, but not so much that you begin to burn. Also, be sure to use a broadband sunscreen with both UV-A and UV-B protection. • Consider your genetic profile: before making your decision on how much sun exposure you will get, use the power of information you may already have. Genetic testing kits are flying off the shelves as people use technology to help learn about their health risks and familial gene pool. There may be information online to help learn about your individual genetic risks. • Know your risk factors: fair skin type, older age, lifetime sun exposure history, exposure to arsenic, medical radiation treatments, conditions or medications that reduce effectiveness of the immune system, history of smoking, being male. • Hydrate more the natural way: instead of reaching for a sugary electrolyte sports drink, get your liquids, electrolytes and sugars through water, fruits and vegetables. Fruits and vegetables are packed with all the electrolytes and glucose your body needs to replenish what’s lost in sweat, and without the sugar spike that comes with sports drinks, which is great news for diabetics. Try to drink half your body weight in ounces of water. If you’re in a dry climate, a hot climate, or exercising, you may need more.